Appeltaart is everything I want in an apple pie. 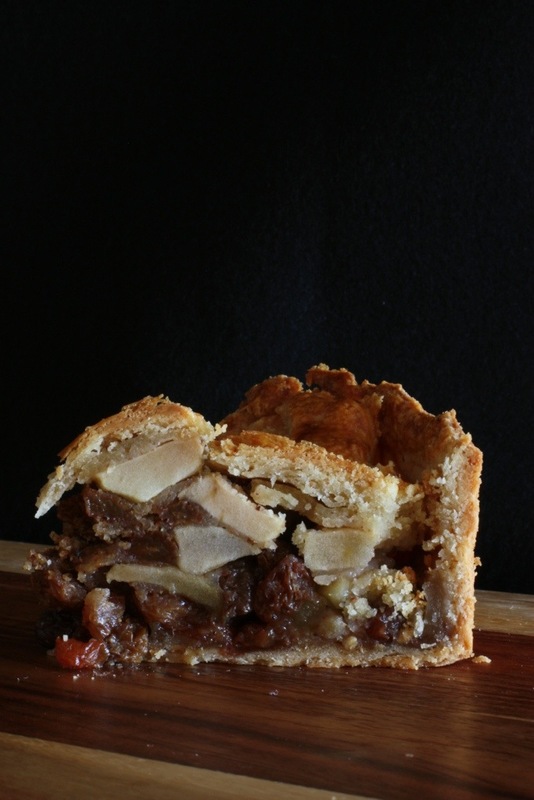 It has a rich buttery crust, large chunks of tart apple, sweet sultanas and a generous amount of spice. It’s not surprising that it is a favourite in Holland. Appeltaart is a very large and rich pie and best eaten on the day it is made. So it is perfect as a celebration dessert or for entertaining. It is best enjoyed slightly warm with a scoop of vanilla ice-cream. It would have been a nice touch to have soaked the sultanas in some apple brandy or something Dutch but I didn’t have either at hand. I simply had to make do with French cognac! It certainly added a lovely richness to the pie. The recipe below has been adapted from the blog The Dutch Table , a great resource for Dutch cuisine. Probably next time I make it, maybe again for the Holland’s Kingdom Day (15 December), I will use slightly more apple and a few less sultanas. What is your favourite type of apple pie? Sift the dry ingredients in a large bowl. Remove the butter from the fridge and grate, using a box grater, in batches, and add to the dry ingredients. Gently rub the butter into the flour mix using only your fingertips until it looks crumbly. Add a small amount of cold water; just enough for the dough to come together in a ball. Form the dough into a disc, wrap in cling film, and place in the fridge. Allow to rest for at least one hour. Place the sultanas and cognac (or whatever you chose to use) in a bowl and allow to marinate. Leave overnight if possible. Preheat the oven to 180C/350F. Line the base of a 20cm/8inch springform tin and grease the sides with butter. Peel, quarter, core and slice the apples. Place the apple in a large bowl with the drunken sultanas, sugar, lemon juice/zest, spices and semolina; stir. Remove the pastry from the fridge and, taking about 3/4 of it, roll into a circle large enough to cover the base and sides of the tin. Gently ease the dough into the tin and shape it into place. Trim away the excess dough. Spread the bread chunks over the base. Add the rest of the filling. Roll the remaining dough into a rectangle and cut into strips. Arrange the strips on the top of the pie in a lattice pattern. Gently press the edges where the strips meet the pastry base. Brush the top with the beaten egg. Place the pie in the oven and bake for about 75 minutes. Cool in the tin for about 30 minutes. Run a butter knife around the edge of the pastry before releasing the tin. 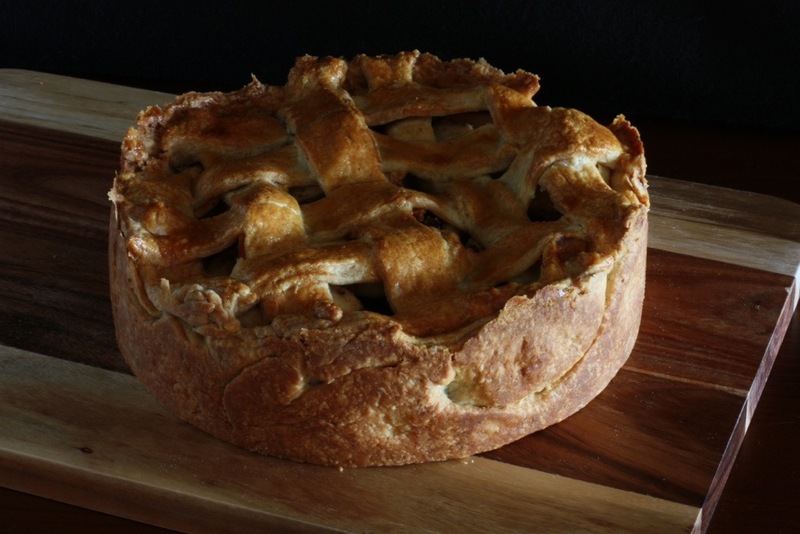 Posted in Pies & TartsTagged appeltaart, apple, apple pie, Dutch, Holland, The Netherlands, vegetarianBookmark the permalink. That pie looks super delicious! It was delicious! It didn’t take us long to finish it! I love Dutch desserts too; so rich and spiced! Wow, your apple pie looks absolutely divine, and packed full of apple goodness, just the way I like it!